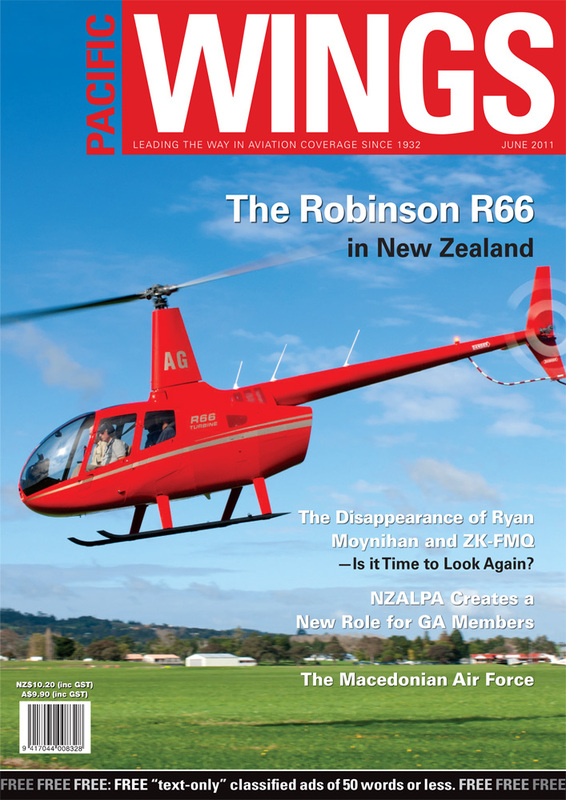 The long-awaited Robinson R66 Turbine helicopter has finally arrived in New Zealand. Ruud van der Zwaal visited Heliflite Pacific at Ardmore to go flying with Simon Spencer-Bower in the latest “Robbie”. For those who do not want to spend thousands of dollars on excessively sophisticated moving-map GPSs in their private aircraft, Ian Boag has developed an effective, low-cost GPS alternative. Ian tells his own story, and describes the background and development of his FlyNav GPS. With the pending retirement of Peter Clements, NZALPA has decided to create a position for a General Aviation Liaison Officer to take up where Peter will leave off. NZALPA’s president, Mark Rammell, outlines the thinking behind the new role. Wellington’s own Erik Roelofs visited Macedonia recently and spent time with that country’s air force. He outlines the Macedonian Air Force’s recent history and challenges, and talks of its future. Organisations like Australia’s Safeskies have been part of a genuine emphasis on aviation safety that is growing all the time and continues to make air travel ever safer. Doug Nancarrow reports on the forthcoming Safeskies biennial conference to be held in Canberra this October. The Disappearance of ZK-FMQ—Time to Look Again? Thirteen years after ZK-FMQ and its pilot, Ryan Moynihan, went missing, Darryl Sherwin thinks he might have uncovered new possibilities about the Cessna 180’s disappearance, and hopes he might be able to solve the mystery.